Britain and France today held a bilateral conference in Paris intended to boost both countries’ digital, data and artificial intelligence (AI) economies and forge closer links between their digital industries. But just like the two countries’ warring history, behind the entente cordiale, both nations really want to outdo each other on the tech battlefield. 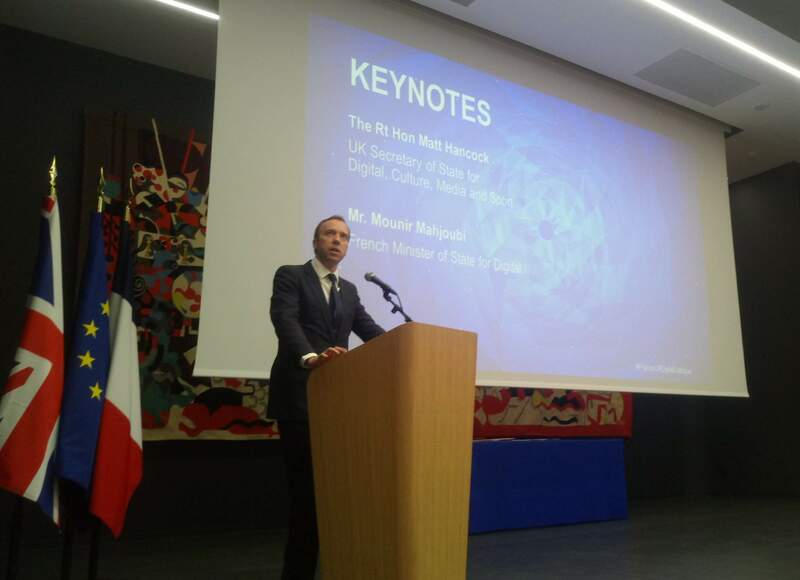 The Department for Digital, Culture, Media and Sport (DCMS), giving details of Culture Secretary Matt Hancock’s visit to Paris for the France-UK Digital Colloque – for ‘colloque’ read “conference” – said the aim of the meeting was “to boost both countries’ digital economies and forge closer links between cutting-edge companies from both nations”, before adding that Hancock wants the message to go out that the UK wants to be the natural home for tech talent. Hancock was expected to say, “I am delighted to see that a new agreement has been signed today, between the UK’s Alan Turing Institute and France’s DATAIA. “They are both doing vital work in data science and AI and this agreement is the first stage in a closer working relationship. And our two governments have today agreed to strengthen ties in AI and data. This will help two of the world’s leading digital administrations better serve their citizens. The ‘colloque’ on data and the digital economy was due to confirm that the Alan Turing Institute is signing an agreement with the French institute, DATAIA, to promote collaboration between the French and British sectors. The DATAIA Institute is the convergence institute in France dedicated to data sciences, artificial intelligence and society. The accord will lead to both organisations pursuing collaborative research in areas of shared interest – for example, in fairness and transparency in the design and implementation of algorithms. They will also work together to share expertise, paving the way for visiting researchers to spend time at each Institute and hosting joint workshops and funding calls. The conference will also see the London-based Entrepreneur First, a beacon for the UK’s excellence in developing tech talent, open a Paris office. Although the UK claims to be winning the tech war, France has let it be known it considers it has a chance of toppling the UK as Europe’s top tech nation, citing Brexit as a catalyst for change. A recent article on the political website, Politico, “France battles to topple Britain as Europe’s top tech nation”, described France’s efforts to take over tech leadership in Europe, with President Macron selling France as a hub for artificial intelligence as hard as Hancock is doing the same for the UK. Hancock has argued that both countries can benefit from the relationship on digital and data. “They are both doing vital work in data science and AI and this agreement is the first stage in a closer working relationship. A strong France begets a strong Britain. They are two sides of the same coin,” he said. To coincide with the UK-France Digital Colloque, the Open Data Institute published a survey that attitudes towards sharing personal data vary across Europe. The research revealed interesting disparities between countries regarding which information people felt comfortable sharing, and with whom. Two surveys – one for the UK in November 2017 and one which included France, Germany, Belgium and the Netherlands in April 2018- were conducted online by YouGov with the data published under an open licence. Wide disparities occurred in banking, with the UK far more confident in sharing data with banks, building societies and credit card companies (57%) and insurance providers (32%) than France where the percentages are 31% and 27% respectively. The online survey also shows large discrepancies in trust in healthcare providers, with 64% of people in the UK trusting the healthcare providers (which, in the UK, includes the NHS) compared to only 35% of people in France. The country with the highest trust in healthcare providers is the Netherlands, which at 71% is twice as high as in France, the lowest scoring country. Medical research charities scored lower in both countries with only 15% in France and 24% in the UK. There is consistently very low trust in the way retailers use data, with France being the most cautious. Online retailers were only trusted by 11% in France, compared to 22% in the UK (the highest score across all countries). However, there is even less trust in offline retailers such as high street shops, with only 8% in France and 10% in the UK saying they trust them. Social media providers such as Facebook and Instagram score universally badly. Only 5% in France and 10% in the UK trust them with data. Trust fell even lower in Germany at just 3%, with Belgium and the Netherlands scoring 8%. The two countries show similar trust levels in family and friends: 55% in France and 57% in the UK. Dr Jeni Tennison, the Open Data Institute’s chief executive, who will be giving the closing address at the Paris event said, “The survey reveals a complex and evolving relationship with data, which varies across countries. Trust in organisations remains a key issue across the EU, but it is good to know that many people are thinking actively about data when deciding which type of data they are comfortable sharing, and which organisations they are happy to share information about themselves with. “This illustrates the need for greater data literacy globally – consumers should be able to understand data not as an abstract concept but as something that relates to their lives and the decisions they make every day, whether managing their bank accounts or utility bills, shopping online or using public transport.